Cool café, restaurant, bar and board game café. Special: No cover charge on weekdays. Play games for free (minimum spend applies). Have a different night out – enjoy games in real life. Come and have fun. Choose from a great menu of eclectic food and drinks. 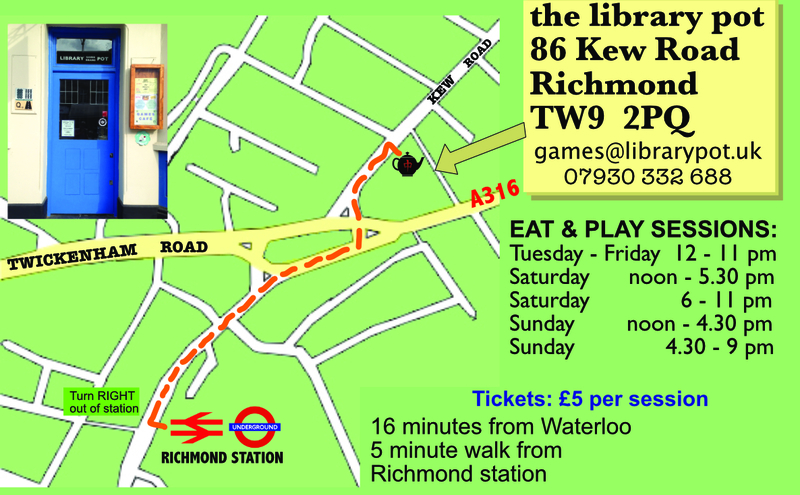 Try some of our quick games, or our library of 595+ board games – stay for many hours without having to rush off. Watch out, time passes differently at The Library Pot while you are having fun. Weekends = £5 cover charge, plus minimum spend £10, per person per session. No games at the table = no cover charge. Special offer on weekdays only applies up to groups of 6, groups of 7 or more see separate page. Minimum spend includes any food and drink (in addition to cover charge at weekends). Any shortfall added to bill. To book a table at The Library Pot restaurant & café, please use the booking widget here (& let us know in the comments if you are coming for games and/or food). For groups of 7 or more, please see the Group Booking page. Or come on your own and join a meetup group. Please join us on meetup dot com (it is free to join) and find out when the meetup groups are in the Library Pot. Join our Mind Sports Olympiad games group, meeting on Tuesday evenings and/or Friday afternoons. Find out more about our olympic meetup sessions here. Closed Mondays including Bank Holidays. Supervised children over the age of 8 years old are welcome. Sorry no toddlers/babies. Available for booking for corporate events & private parties. With 89% Excellent (5*) reviews TripAdvisor has awarded us a 2018 Certificate of Excellence. We also have a brand new 5* Food Hygiene Rating!